The technique for cleaning raspberries is very simple: don’t do it. 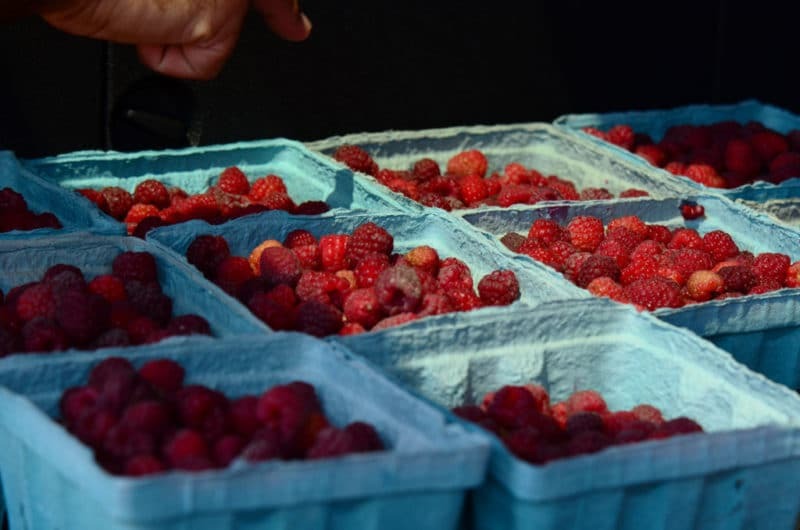 Even when raspberries are coated with a bit of dust from the field, it’s better to leave them alone or just rub off what you see than to clean them. The moment raspberries come into contact with water, they begin to look like they are melting away. If you feel you must wash your berry, use as little water as possible just before eating it. For our purposes this week, there is no washing allowed! That’s because we are going to marry raspberries with chocolate (o happy day), and water would be an unwelcome third wheel. Wherever chocolate is concerned, water must be kept apart—as in, separate tables, separate bedrooms, separate separate. Plus we want our berries to stay as plump and pretty as possible. When we brought home our ten pounds of u-picked raspberries, there was some question as to how to keep them. Our fridge was scary-full; we almost bought a second one right then and there. The berries sat on the counter while everyone went about their other business of the day; we all walked by waiting for someone else to deal with them. The berries either needed to be eaten immediately—a task even our crowd was not going to accomplish—or else kept chilled so they would last through the weekend. I dove in and reorganized the refrigerator (a.k.a. : threw a lot of food away; it was unavoidable) to accommodate six of the raspberry baskets. Then in some plastic Ziploc containers I froze the raspberries from four more baskets. There was a lot of input and disagreement about how to freeze them—ideally one would take a two-step approach by separating each berry out onto a sheet pan and freezing them so that they wouldn’t stick together, then putting the frozen berries all together in a container to freeze that way. There was no way, no how we could put individual berries on sheet pans in the freezer last week. We had too many berries and the freezer was filled with its usual too-much, plus an unacceptable quantity of hot dogs and buns leftover from the 4th of July and ice pops of every color. So we simply filled the plastic containers with the berries and froze them that way, knowing that even if they melded together, they could still be put to a delicious use later. But I’ve checked on the frozens a few times and they look quite separate and fine to me. Two baskets of berries were still left after that, and those we left on the counter for passers-by to eat, which they did, without washing a-one of them. Ingredient: Raspberries, U-Pick Chocolate-Covered Raspberries. Razzle-Dazzle. 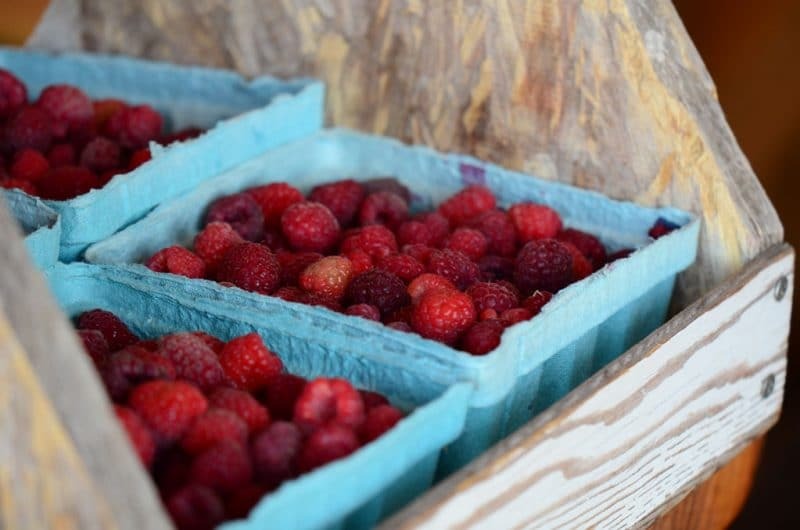 3 Responses to "Technique: How to clean and keep raspberries"
I have the how-to-freeze-strawberries conundrum every year. I do wash and hull the berries, so there’s oodles of moisture. I use quart bags, and generally everything freezes in one messy red lump. So I slap the bags down hard on the counter. Throw them, really. Usually repeatedly. It’s very loud and inelegant. I dont like to wash raspberries either but i have little black bugs i cant get off without washing. Any suggestions?